When you’re on a budget – and a time constraint – the super market can feel like one giant maze. You crisscross from one side to another, practically develop frostbite in the frozen food aisle (twice! ), and completely forget what you ultimately came shopping for in the first place. Not to mention, you get suckered into the traps the store deliberately places in your way. We bet sometimes you wish you just had a magical map that would let you know where to go to find what you need in the fastest way possible. Well, here at Basket we heard your silent pleas. While we can’t completely predict the layout of your grocery store, we’re giving you the next best thing: hacks to navigate the science of the grocery store for the best savings. And we’re talking time and money! Let’s get started, shall we? Okay, so maybe battle is a bit too exaggerated. But, that’s how it can feel, right? When we say come prepared, we mean come equipped with a list. We recommend using the Basket app to make your list, and not because we’re biased. The Basket app allows you to update your list throughout the week as you scope out what items you need, and will show you the lowest price near you. This way, once you get into the grocery store you already have a tentative total for your shopping trip and a shopping list that’s easy to find. A list that won’t end up crumpled into a ball or forgotten at home. A win-win! The grocery store can be full of distractions and temptations. You can see a sale sign for something you absolutely don’t need, but toss it in your cart anyway. While we’re about to dive into how to avoid these grocery traps, we must urge you: if you encounter them, resist the temptation! Stick to your list and only your list. Remember, that list contains all of the items you actually need. Scoping out additional items will not only add more time to your trip, but it will also add expenses. At the grocery store, the list is law. Once you’ve entered the grocery store, resist the urge to plow full steam ahead. Instead, veer to the left or right, and make one big square around the perimeter of the store. Chances are, the majority of your grocery staples will be kept here. Fruit and vegetables will be along one side, then meat and dairy, lunch meat, and frozen food and alcohol along the others. Though they might not always be in the same order, these big ticket items are typically always kept along the perimeter of the store. There’s a reasoning behind this: If you don’t travel around the perimeter as we suggested, you end up weaving back throughout other aisles to locate your items – scooping up additional groceries along the way. This tactic can force a shopper to spend both more time and more money in the store, something we want to avoid. When you walk into a grocery store, 9 times out of 10 you are greeted with bright bouquets or the scent of freshly baked bread. This isn’t coincidence, it’s science. The scent of flowers and baked goods activate your salivary glands which literally make you more likely to make impulse purchases. Plus, these sweet items give a boost to your mood at the time when your optimism is high and your cart is empty – a perfect time to buy things you do not need. Did you ever notice that behind the array of flowers and baked goods, there’s typically a specialty counter? In some grocery stores, this will feature an employee cooking up a dish (hello, salivary glands!) and in others it will feature “signature” or “limited edition” items. Have you ever questioned the organization of the items on store shelves? More expensive items as well as sugary and processed foods are typically always at eye-level. This way, you see, you grab, you buy. Not to mention, there’s the child eye level. This is where sugary cereals, snacks, and well advertised items will be placed: perfect for your little one to spot immediately. Here’s another sneaky trick grocery stores play: the items you are most likely to buy tend to be on the right hand of the aisle. Why? Again, science. Most stores try to encourage customers to travel the store from right to left, and as customers we’re conditioned to move this way from the practice of driving along the right side of the road. So, when you maneuver your cart aisle to aisle, you remain along the right side. Scan the top and bottom of each shelf, not just what’s at eye level. Allow your eyes to take in both sides of the aisle, not just what you see to the right. Again, stick to your list! You might think that the music playing in the store does little to effect your navigation skills. Ha! False. Studies have shown that slow music makes people spend more time in store and increases the likelihood they’ll spend more money. Loud music increases shoppers’ speed. And, get this: Classical music leads people to purchase more expensive items. To stay in your own budget-zone, bring some headphones to pop in while you shop. This will keep you safe from the suggestive music playing in the store, and will also give you some time to relax by yourself. Just do yourself a favor: Don’t blare your own volume. You still want to be able to hear the person behind you say “Excuse me” if you spend three minutes in the middle of the bread aisle working on your dance moves. Okay, you’ve made it this far. Don’t back down now! The checkout line is without a doubt the money sinkhole of the grocery store. The rainbow of candies, chocolates, and gum are all super tempting. Plus, the magazine you’ve been pretending not to read for the past 18 scans will most likely find its way into your bag. 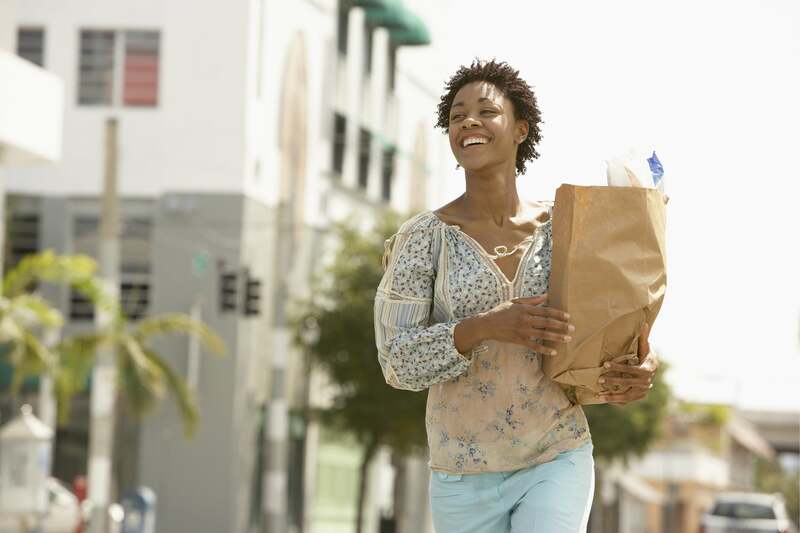 Try going to the store for smaller, more frequent trips when you can. Massive bulk shops every now and then typically mean you buy way more than you need. Plus, fresh fruits and vegetables as well as other perishables turn quickly, meaning that if you don’t eat everything you’ve bought immediately, you’ve essentially thrown your cash in the trash. Try to make stops more frequent, and limited to the items you’re running low on throughout the week.